Making room for your hobbies at uni is a pretty tough task, especially when you have a lot of make up to store. In my university room, which is quite cosy (Wanted to keep my rent prices down! ), I’ve a nice sized desk where I can display most of my make up (The rest is at my parents house), my laptop, hair straighteners, and some books. To store my make up and keep them looking tidy and presentable I use clear acrylic draws, stands and stationary tidies that I bought from Amazon from the Osco range. I saw a few YouTube beauty gurus with clear drawers and thought it looked cute and tidy and that was what made me choose these. I store and present my Barry M nail polishes on a clear nail polish rack that can hold up to 30 bottles, and it really shows the polishes off, which I think is really attractive. My powders, eyeliners, eyeshadows, concealers, primers, bronzers, and blushes are stored in clear osco drawers which are really useful as they look attractive, and you can stack them on top of each other to save space! 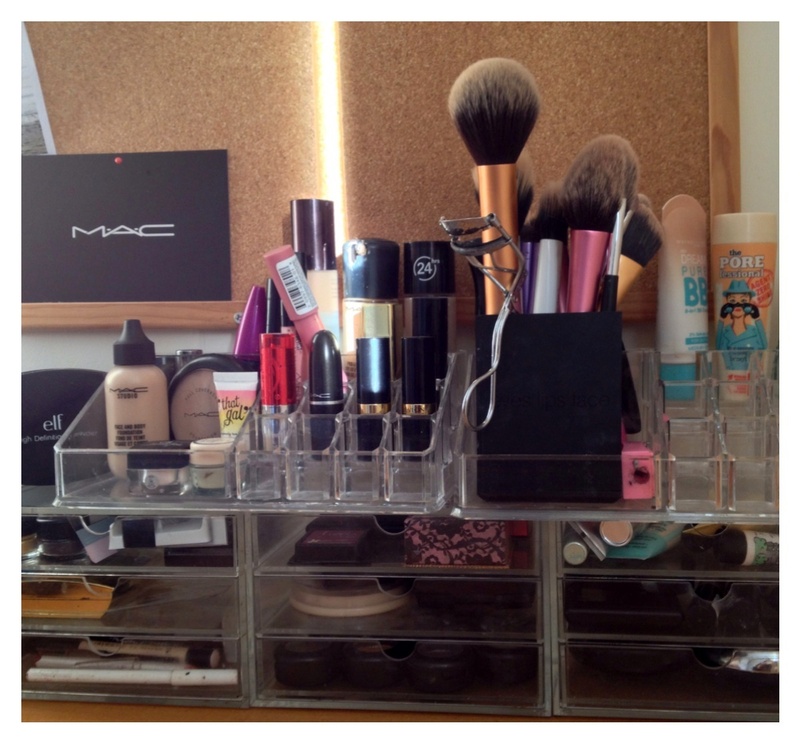 I store my foundations, mascaras, lipsticks and other bits and pieces on a clear “Glam cosmetic organiser” or desk tidy that matches the clear osco drawers and the clear nail polish rack. And finally, I store my brushes in a small ELF black brush holder that is fast becoming too small for all my brushes, however ELF do sell a bigger brush holder which I will be buying soon! These organisers and pretty inexpensive and save space and look really nice to as they show of your products and makes your collection look clean and professional. Great organization! No matter how much I organize my vanity ends up being a mess! I need some storage containers like those I think.